Every day hundreds of homeowners and businesses benefit from Aptera dumpster rentals in San Diego County, CA for both short and long term projects. Our experts will help you save up to 40% and make sure your dumpster is delivered on time to keep your job site running smoothly. Aptera's experts have every type of dumpster from small bins to large roll off dumpsters and they will use their experience to perfectly match your specific needs. If your debris is heavy for the material size, such as with shingles, you may want to consider renting a larger dumpster to avoid tonnage fees. You will need to start by estimating how much waste you need to dump. One trick is to measure the debris pile (length by the width by the height) and divide the total by 27; the result is the amount of waste in cubic yards. If the debris is spread out just do your best to guesstimate and then round up to make sure you have enough space in your dumpster. Small Dumpsters - A small dumpster rental (3 yard to 8 yard in length) provides a cost-effective way to dispose of debris from a bathroom remodel or waste accumulated weekly by a moderately sized office. They fit well in alleyways, on driveways and do not stand out as an eyesore in residential neighborhoods. Large Construction Roll-Off Dumpsters - For heavy duty use on construction sites in San Diego that create a lot of debris, roll-off dumpsters from 10 yard, 20 yard, 30 yard, and 40 yard options get the job done. When you rent a roll off dumpster in San Diego, Chula Vista and Oceanside for a construction project or whole home clean out you get much more capacity and over 2 tons worth of allowable tonnage per pick up. *Note - Roll off dumpsters are heavy even before you load them up, so be sure the area where it will be placed is level and firm. A delivery truck will also need room to maneuver and roll it off the truck frame onto the ground as the vehicle moves forward. So if you are renting a 40 yard roll off dumpster in San Diego and Chula Vista, leave at least an additional 40 yards for delivery. Disclaimer: Actual amount of weight you are able to fit into dumpster in San Diego County will vary based on garbage density. *very dense waste such as roof shingles, concrete, etc. can max out your allowable weight with cubic yardage to spare so be sure to ask about overage fees. Secure Your Dumpster - To avoid other people dumping their waste into your dumpster you have a few options. For smaller dumpsters you can place a lock on the lid. For 20 yards or larger dumpster rentals in San Diego and Chula Vista you can strap a tarp across the top of the roll off each night. While not completely secure, a tarp does inhibit people from freely and quickly filling up your bin. Find the Right Placement - Make sure the dumpster rental is going to be sitting on flat ground and that the delivery driver will have plenty of room to maneuver. You may incur extra charges for an un-deliverable dumpster. Keep in mind that you need approximately twice as much space as the width and height of the roll-off for safe delivery. Safety - Keep all people and animals away from the delivery area while the dumpster is being unloaded. Dumpsters are extremely heavy and can present a crushing hazard. Ensure that friends, relatives, or employees use gloves, masks, and eye protection when handling debris. Use Proper Loading Techniques - Make sure the dumpster is loaded evenly to prevent tipping. You can fit in more debris if you take a little time to pitch items in a strategic manner. Randomly tossing 2 x 4's into the dumpster could leave a lot of wasted space. Carefully stacking the lumber leaves more space for other debris. Educate Employees - Make sure your employees know which materials are prohibited from being placed in landfills in San Diego, Chula Vista, Oceanside, Escondido and Carlsbad. These include tires, car batteries, asbestos, paint, or items containing refrigerants. It is never okay to put radioactive or hazardous materials into a dumpster. Compare Dumpster Rental Prices in San Diego County - When comparing quotes, take a look at the fine print. Will there be additional charges for delivery or pickup? Will the dumpster rental company in San Diego charge you a fee if you need to keep it longer than anticipated? Are landfill charges included in the price? Offices buildings, apartment complexes, retail stores, gas stations, grocers, restaurants, and banks all need ongoing dumpster rental service in San Diego, Chula Vista and Oceanside. Daily, weekly, or monthly pickup/unloading are available depending on the amount and type of debris. Rates in San Diego County are heavily discounted over one-time rentals but typically require a service contract. There is no better way to take care of all your waste needs all in one place. Let the professionals at Aptera help you today. San Diego 3 yard dumpster rental costs $186, 10 yard dumpster rental costs $274. Chula Vista 3 yard dumpster rental costs $216, 10 yard dumpster rental costs $318. Oceanside 3 yard dumpster rental costs $218, 10 yard dumpster rental costs $322. Escondido 3 yard dumpster rental costs $188, 10 yard dumpster rental costs $277. Liberty Recycling A Waste Mgmt. 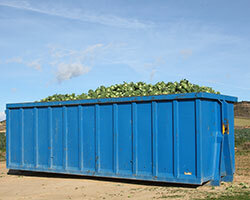 Co.
Carlsbad 3 yard dumpster rental costs $213, 10 yard dumpster rental costs $313. El Cajon 3 yard dumpster rental costs $194, 10 yard dumpster rental costs $285. Vista 3 yard dumpster rental costs $200, 10 yard dumpster rental costs $295. San Marcos 3 yard dumpster rental costs $184, 10 yard dumpster rental costs $271. Encinitas 3 yard dumpster rental costs $179, 10 yard dumpster rental costs $263. National City 3 yard dumpster rental costs $168, 10 yard dumpster rental costs $248. Estimated San Diego County dumpster rental prices include delivery and pickup of the roll-off and dry waste only. Does not include landfill fees or permit applications.